The gradual reduction in the use of AGP coincided with an increase in the therapeutic use of antibiotics on farm level. 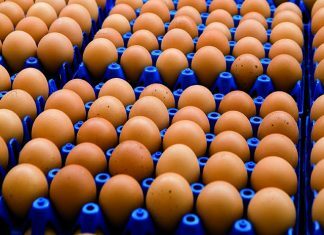 Especially in broiler chickens the on farm treatment for correcting gut health related issues (dysbacteriosis, clostridial enteritis) reached high levels. Apparently AGP were quite effective in masking sub-optimal conditions, farm management and nutrition. The unwanted side effect of the ban on AGP resulted in 2008 in an agreement between the Dutch government and the industry that the therapeutic use of antibiotics had to be reduced by 70% in 2015 taking 2009 as the reference. In 2016 this goal was reached. 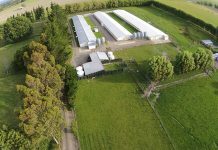 Our today’s strategy of raising broilers without antibiotics is aimed at maximizing gut health, which we define as having ‘the right flora in the right place’. Without defining what the right flora is in terms of bacterial species, it is a relative sterile duodenum with an increase in both numbers and diversity of bacteria towards the hindgut. In terms of functionality the right flora ferments carbohydrates instead of proteins and produces butyrate to fuel enterocytes and to maintain gut integrity. When designing dietary interventions to support gut health and to minimize the use of antibiotics the following aspects need consideration. A well-developed and functional gizzard is the basis for maintaining gut health. A functional gizzard has a low pH because of increased secretory activity of the proventriculus and prolonged retention time. The low pH supports the anti-bacterial barrier and the low pH of the chyme leaving the gizzard increases pancreatic activity. A functional gizzard also leads to reflux of duodenal contents together with bile salts so emulsification of dietary fat will already start on gizzard level. Combined with a reduction of average particle size of the chyme entering the duodenum a functional gizzard improves digestibility of organic matter and contributes to keeping the right flora in the right place. Coarse fibre in the form of oat hulls is the strongest stimulator of gizzard development and functionality. When not available coarse grain particles either from wheat or corn will also contribute to gizzard development but rather large amounts are needed. An addition of 2,5% of oat hulls is sufficient for optimal gizzard functionality. When using coarse grain particles to stimulate the gizzard than at least 20% of particles >1,4mm are needed. The type of feed processing will determine to which extent the coarse grain particles will survive the production process. So particle size needs to be checked by frequent wet sieving analysis of the finished products. Be careful with feeding too much coarse particles to broiler chickens in the first week of age. They can accumulate in the crop and gizzard with the consequence of reduced feed intake and increased risk for hypoglycaemia. Wood shavings might also be an alternative to oat hulls. Undigested protein leads to an undesired shift in the bird’s microbiota and the fermentation products of protein like ammonia and biogenic amines are detrimental for gut health. In diets low in undigestible protein the effect of AGP on gain and fcr is small in comparison to diets with low protein quality. Besides protein digestibility also protein quantity and amino acid balance are of importance. The nitrogen coming from excesses in digested amino acids have to be excreted via the urine causing higher water intake with increased risk for wet litter which will put gut health under more pressure. To support gut health diets have to formulate based on an ideal digestible AA profile and all commercially available synthetic AA to reach as low as possible levels of crude protein should be used. The concomitant reduction in potassium will further contribute to a reduction in water intake. Diets low in crude protein will also contain less undigestible or fermentable protein. In regions where wheat is the major cereal it is standard practice to apply a xylanase to avoid increases in gut viscosity and the problems associated with it. Increased viscosity of the chyme leads to an increase in bacterial activity in the upper part of the intestine. Bile salts are deconjugated resulting in a reduced digestibility of fat (in particular long chain saturated fat), which negatively impacts digestibility of protein ending in undesired shifts in flora composition throughout the gut and impaired gut health. Although levels of viscosity in duodenal contents of corn-soy based diets are not considered as detrimental to bird performance applying a xylanase might still be beneficial. There is evidence suggesting that via formation of fermentable oligosaccharides the use of a xylanase of bacterial origin (in corn and in wheat based diets) will stimulate the endogenous production of butyrate. Butyrate production is seen as typical for a healthy microbiota. The costs of using a xylanase in corn-soy based diets are more than paid for by the extra energy liberation that it also delivers. The insoluble complex of phytate and calcium is a strong antinutritional factor and its formation, which is pH dependent, should be avoided. By using a modern phytase with a low pH optimum, certainly when applied in a higher dose, phytate will quickly be broken down and formation of insoluble complexes is avoided resulting not only in maximization of the liberation of phosphorus but also in no stimulation of mucus production on gut level. To avoid problems with higher water intake and wet litter when using a more effective phytase a critical judgement of levels of calcium and sodium and the quality of the limestone source is needed. Maximizing gut health is impossible in the presence of coccidiosis. The right choice of anticoccidials (both chemical and ionophore) and the duration of their use during a cycle highly contribute to maintaining gut health and to a reduction of the chance of having to apply an antibiotic treatment because of impaired flock welfare due to disease. Use of anticoccidials is still allowed within the EU. When in ABF programs the use of ionophores is not allowed control of Clostridium perfringens becomes even more important (but also more difficult). In The Netherlands vaccination against coccidiosis is standard practice for rearing broiler breeders and laying hens but uncommon for broilers. Several studies have been published on the antibacterial effects of medium chain fatty acids (MCFA’s; C8-C10-C12) and their effects on bird performance in diets free of AGP. Free lauric acid (C12) either from commercially available mixtures or from split palm kernel oil is widely used in Western Europe to suppress the growth of Clostridium perfringens in the small intestine. Butyrate generally demonstrates positive effects on gut development and integrity, control of enteric pathogens like salmonella, reduction of inflammation and improvement of performance. To exert these effects butyrate has to be present at gut level so target release products are needed. Plant extracts can have antibacterial properties and also stimulate pancreatic activity. Use of a proper phytogenic product will certainly contribute to maintaining gut health. There are indications that the combination of MCFA’s and plant extracts has a synergistic effect on bird performance under AGP free conditions. Due to the hatch window and transportation time it is inevitable that broiler chickens have delayed access to feed. 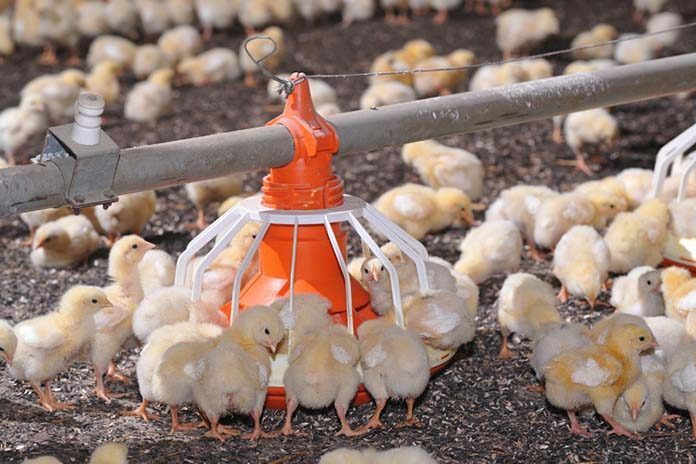 Feeding day-old-chicks as quickly as possible has proven positive effects on uptake of yolk, gut development and functionality, immunity and subsequent performance. To overcome the problems associated with delayed access to feed housing and hatching systems have been developed in The Netherlands in which birds are provided with feed and water right after hatch. Early feeding improves performance and reduces the need for using antibiotics. In ovo feeding will be insufficient to overcome the negative effects of delayed access to feed. Under pressure of an animal activists group Dutch retail completely switched from selling meat from conventional fast growing genetics like Ross308 and Cobb500 to slow growing breeds like Hubbard JA987 and Ranger Classic. Today one third of Dutch production (for internal market; export still on conventional) consists of slow growing breeds not allowed to exceed an average daily gain of 45-50 grams when slaughtered at 50 days of age. Experiences so far indicate that these slow growing birds appear healthier and need less antibiotic treatment for digestive disorders. This switch has certainly contributed to the reduction in the use of on farm antibiotics as seen in The Netherlands in the last couple of years. Probably the lower stocking density and the lower protein levels in the diets used play a large role in this reduced need for treatment because the breeds themselves are not less sensitive for gut health related issues. Applying the above-mentioned nutritional interventions will contribute to less need for antibiotic treatment due the digestive disorders but only when combined with good farm hygiene, proper bird management and optimal disease control.